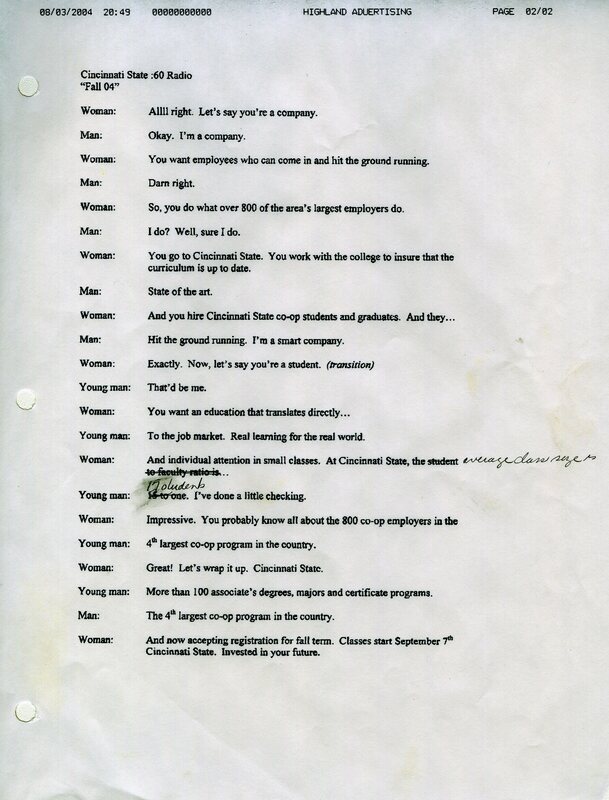 “State of the art” training in emerging technologies took center stage in Cincinnati State’s advertising efforts for the new millennium. How do you think the new logo conveys the Cincinnati State brand in the 21st Century? In addition to a logo change, the campus got another facelift with the construction of a new parking garage and the Advanced Technology & Learning Center. The name of the new building conjured images of a high-tech learning laboratory. The Midwest Culinary Institute found its home in the ATLC. Cincinnati State was “The College with Connections” for the first half of the decade before transitioning to a new logo and marketing campaign. “Go Ahead. Get There.” popped up on billboards all over Cincinnati in 2007. “The College with Connections” refers to the co-op program with its extensive network of hundreds of co-op employers. “Go Ahead. Get There.” implies that Cincinnati State gives students the advantages they need in order to achieve their goals, whatever they might be. This ad promotes the option to begin work immediately after completing a degree at Cincinnati State, or to continue on to a four year institution, having saved money on the first two years. “Fall 04” ties co-op to cutting edge technology. This commercial takes the viewer on a humorous journey through the last several decades of technology. In the video we see that what was once “state-of-art” can become a dinosaur quickly, often leaving businesses with a shortage of employees trained in the necessary systems. Cincinnati State promises to keep students and employers on the cutting edge by providing training in new technology and a steady supply of skilled co-ops to area businesses. This ad campaign used the same slogan to promote both aspects of an education at Cincinnati State: technical and academic. In the first ad pictured below, the benefits of the co-op program are emphasized. The first line of copy boasts the number of co-op placements available to students. The last line boasts the graduate job placement rate of over 96% at that time. 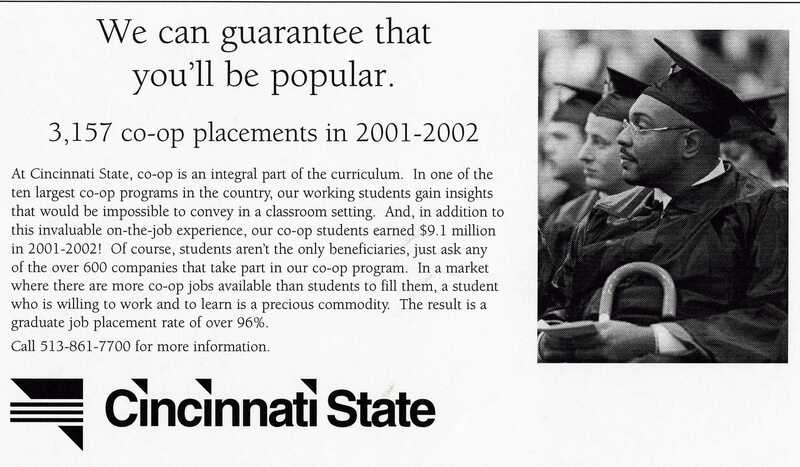 In the ad to the right, the same slogan is used, but the copy instead lists colleges and universities which have recruited students from Cincinnati State to complete a 4-year degree. In a clever pitch, the college manages to highlight the academic and technical sides of Cincinnati State equally. The gallery below features billboard advertising proofs from the late 1990s-early 2000s. Click any image to view as a slideshow. The article below explains the message behind Cincinnati State’s recent “re-branding”. Go Ahead. Get There ads and billboards appeared in 2007, showing us the “face of Cincinnati State”.